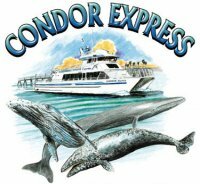 The Condor Express is Santa Barbara's newest, most modern whale watching, party cruise, and private charter vessel, launched in March 2002. A beautifully appointed vessel, the Condor Express boasts large walk-around decks, a generous upper sun-deck, and a raised forward bow area. These features provide unparalleled, close-to-the-action, viewing of the Santa Barbara Channels' marine life and scenic coastline. The luxurious teak-paneled cabin seats 68 people for comfortable dining with a smoked glass skylight. The Condor Express is the ideal platform for whale watching, island excursions, weddings and receptions, company charters, dinner cruises, educational and research trips - virtually any type of ocean outing! The Condor Express's unique combination of speed, luxury, safety, and experienced crew offers our passengers the opportunity to see and experience more of the sights, wildlife, and beauty of the Santa Barbara Channel and the Channel Islands than any other vessel. Today, with the California Gray Whale population restored to its pre-whaling numbers (18,000-26,000), and the recent appearance of Humpback and Blue whales during the summer months (since 1992), whale watching aboard Condor Cruises has evolved into a year-round adventure. With more than 30 years of experience, over 100,000 satisfied passengers, and a love and appreciation for the ocean and its inhabitants, Condor Cruises has evolved into one of the most successful whale watching and private charter boat operations in the U.S.
Visit www.condorexpress.com or call 805.882.0088 for more information. Trips depart delay from the Sea Landing (Cabrillo Blvd and Bath St).